Northern California’s Lost Coast is located in northern Mendocino and southern Humboldt counties, north of San Francisco. Steep mountains plunge down to a rocky shore. Lonely beaches with waterfalls and good abalone hunting face out on great surfing breaks. Just inland, wildlife abounds in the forest and small communities are separated by majestic redwood groves. 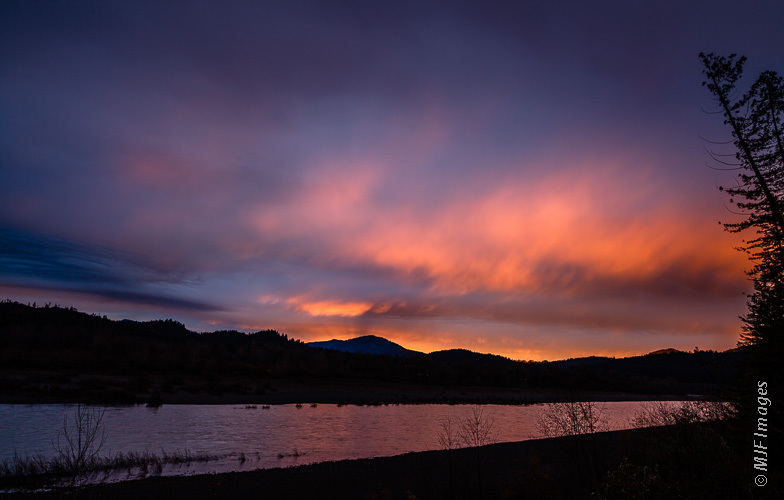 The rising sun sets the sky afire in Humboldt Redwoods State Park, California. The Lost Coast includes the King Range, a rugged, steeply uplifted piece of geology with many valleys oriented parallel to the coast – a very unique situation. California’s western-most headland, Cape Mendocino, occupies much of the Lost Coast. These two geographic facts give the place its isolated character. And as usual, the geology of the region is the underlying factor driving everything. The Lost Coast of northern California is the scene of a peaceful winter’s sunset. The famous San Andreas Fault, which parallels the coastline all the way north from San Francisco, leaves the coast here and merges with the offshore Cape Mendocino Fault (which runs perpendicular to the coast and out to sea). This is where three of the Earth’s tectonic plates come together. The North American Plate, the Pacific Plate, and the small Gorda Plate join in what geologists call a triple junction. 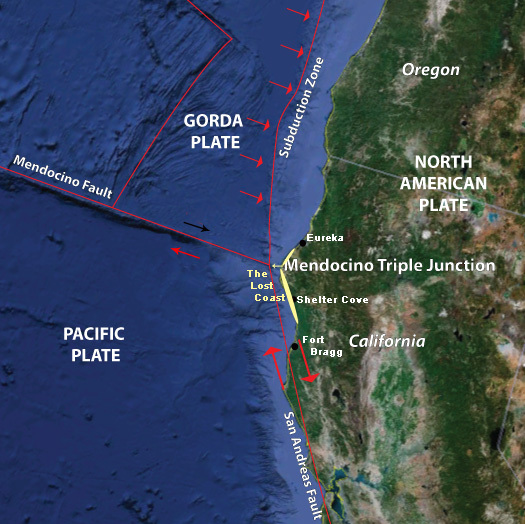 The plate tectonic setting for the Lost Coast of California is dominated by the triple junction just offshore from Cape Mendocino. The slip-sliding characterized by the San Andreas to the south gives way to a subduction zone to the north. The Gorda Plate is slipping beneath the North American Plate. This means that a line of volcanoes lies inland. The Cascades begin at Mount Lassen and extend north past the Canadian border. But much closer to the coast, an enormous torquing action occurs, which is why the uplift is extreme here. The rocks are heavily buckled and folded, forming the rugged King Range. The part of the northern California Coast between Fort Bragg and Eureka is called the Lost Coast. The coast’s spectacular scenery owes its existence to this triple junction. Rapid uplift of a coastline is marked by frequent earthquakes and landslides, and this area is no exception. Offshore sea stacks, for e.g., are often the result of enormous landslides in the past. And of course landslides are often precipitated by earthquakes. All the while erosion is taking place, from constant wave action. And the uplift of the coastal margin gives the waves a constant source of new rocks to erode all the time. Ice Plant, a non-native, blooms in winter-time on the Lost Coast of California. I stopped in the little town of Garberville, just off Hwy. 101. It is a typical northern California town, filled with real characters. Not all of these people, believe it or not, are old burnt-out hippies. For the first time during this trip, I didn’t feel out of place in my VW camper. Now if I only had a dreadlocks wig as big as one of those giant octopuses that live in the nearby ocean, I would have fit in perfectly. Actually the town is peaceful, with a magnificent stand of redwoods nearby in the Humboldt Redwoods State Park. 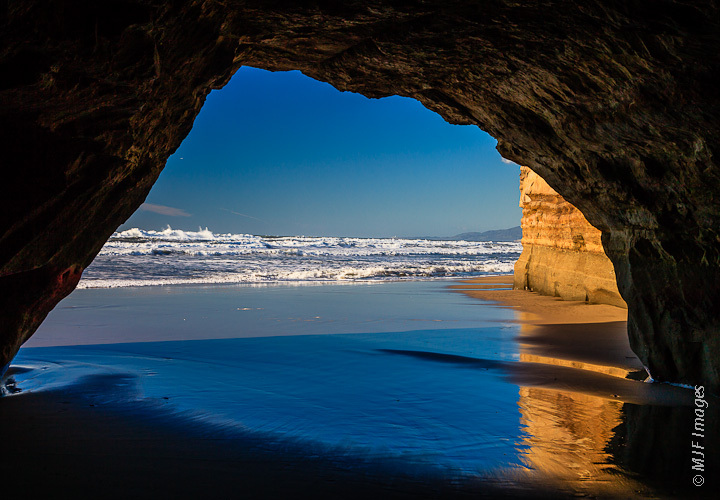 A cave on a northern California beach looks out on a sunny Pacific day. Then I headed over the extremely curvy and hilly two-lane that leads from Garberville out to the coast at Shelter Cove. What a road! The last hill descending off the King Range to the coast is extremely steep, granny gear both ways. The little settlement of Shelter Cove is spread out, and seems to be populated by people who enjoy their isolation. I wouldn’t necessarily call them anti-social loners, but there is a reason why they live here. Almost 1000 people live here, but I am sure many of the spectacularly-located houses are 2nd homes. A beach house on the coast of California. I experienced a nice sunset, getting there early enough to explore the rocky shore below the little park. This park is easy to find if you turn left at the first T-junction after the big downhill. The grassy park, set up on a terrace above the sea, is centered around the Cape Mendocino Lighthouse (see below). It’s a simple walk down to the rocky shore from this park, and you can continue south past the boat ramp around Shelter Cove itself. The rock is black, and forms dramatic silhouettes with the numerous tide pools. Be careful though, and consider rubber boots if you’re planning on exploring and/or photographing. It’s slippery and there are sneaker waves. It’s wise to remember the venerable warning to never turn your back on the ocean. The rocky coastline at Shelter Cove on California’s Pacific Coast is a tide-poolers heaven. This stubby structure, which dates from 1868, did not need to be tall since it was originally placed atop a 422-foot (129 meters) cliff on Cape Mendocino. It was shipped to the site and hauled up the steep mountainside. The first ship sent to start construction at the site ran aground, and all supplies were lost (everyone survived though). Over the years, the light saved many lives, and in more ways than the obvious. For one thing it was a great lookout. On one occasion a keeper spotted a ship that was on fire. He brought help just in time to save all aboard. The Cape Mendocino Lighthouse, now restored and located in nearby Shelter Cove, glows just after sunset. But the frequent earthquakes and landslides were a constant hazard, and the lighthouse was eventually abandoned in the early 1960s. The lighthouse was later saved when a local group had it moved and restored. For the last 12 years it has shone at Shelter Cove not far south of the Cape. But its business end seems a bit empty without its original Fresnel lens (which was replaced years ago while it was in service). I also enjoyed some time in the redwoods at Humboldt Redwoods State Park. There is a 2-lane road (appropriately called “Avenue of the Giants”) that parallels Hwy. 101, allowing you to stop and walk through the big trees, or enjoy the beautiful Eel River (which winds its way through here on its way to the sea). An amazing variety of stones are present on this northern California beach. It’s a beautiful and remote stretch of coast, one I can highly recommend visiting. The coast both to the south (as far as Point Reyes) and to the north (the Oregon border and beyond) is also beautiful. I didn’t get the opportunity this time to explore the Lost Coast fully. There are hiking and mountain biking options, plus several fire roads that take off from the Shelter Cove Road. I encourage you to go further than I did in exploring this rugged part of the California Coast. I know I’ll do so when I return. The Pacific Ocean and the day’s last light stretch west from the Cape Mendocino Lighthouse in Shelter Cove, California.